Secondary water quality impacts (SWQIs) from anaerobic bioremediation are changes in water chemistry that result from adding an organic substrate to the subsurface to enhance contaminant biodegradation. Common SWQIs that occur at most sites include increases in dissolved manganese, iron, and methane. Fortunately, SWQIs are usually restricted to areas that are already contaminated and attenuate with distance downgradient in well-understood ways. Electron donor addition can be very effective in stimulating enhanced anaerobic bioremediation (EAB) of a wide variety of groundwater contaminants including chlorinated solvents, high explosives, perchlorate, and certain metals and radionuclides. However, this can result in secondary water quality impacts (SWQIs) including decreased levels of dissolved oxygen (O2), nitrate (NO3-), and sulfate (SO42-), and elevated levels of dissolved manganese (Mn2+), dissolved iron (Fe2+), methane (CH4), sulfide (S2-), organic carbon, and naturally occurring hazardous compounds (e.g., arsenic). Fortunately, the impacted groundwater is usually confined within the original contaminant plume and is unlikely to adversely impact potable water supplies. During EAB, large amounts of easily fermented organic substrates are added to the target treatment area to degrade or immobilize the contaminants of concern (CoC). These substrates are fermented to hydrogen (H2), acetate, and other volatile fatty acids that are then used as electron donors by microbes to mediate oxidation-reduction (redox) reactions that reduce dissolved oxygen, nitrate, and sulfate as well as Fe3+ and Mn3/4+ containing minerals and the CoC. Figure 1 shows a typical pattern of SWQI parameters with time in the: 1) injection area; 2) near plume (25 m downgradient); 3) medium-distance plume (50 m downgradient); and 4) far plume (100 m downgradient). These curves were generated using a geochemical model developed to simulate SWQI production and attenuation, and calibrated to long-term monitoring data from field sites where organic-rich materials have entered the subsurface. The time frame for production and attenuation of SWQIs can vary from 10 to 100+ years, depending on the amount and duration of substrate addition, groundwater flow velocity, and background electron acceptor concentrations. Figure 1. Typical variation in SWQI Parameters over time with distance from injection. Graphs compare concentrations in injection area, 25 m, 50 m and 100 m downgradient for 40 years post-injection. Organic substrate addition causes a rapid increase in total organic carbon (TOC) within injection area monitoring wells with maximum concentrations typically ranging from 50 to 500 mg/L (Fig. 1). However, much higher TOC concentrations were observed at some sites. TOC concentrations often remain high for several years in the injection area due to the use of slow release electron donors (e.g., emulsified vegetable oil or ((EVO)) and/or repeated substrate injections, and then decline once substrate addition ends. However, low levels of TOC may continue to be released from endogenous decay of accumulated biomass. Increases in carbon loading are expected to result in greater SWQI formation. However, these SWQIs will attenuate with time and distance downgradient. Reducing the carbon loading to decrease SWQIs production may reduce treatment efficiency, possibly resulting in greater exposure to chlorinated solvents and other contaminants. Maximum TOC concentrations in downgradient wells are generally much lower than in the injection area, indicating TOC in the aqueous phase is rapidly consumed and does not migrate long distances downgradient. Rapid consumption of TOC in the injection area is due to reactions with background electron acceptors (e.g., O2, NO3-, Mn4+, Fe3+, SO42-), the target contaminants, and fermentation to CH4. Since TOC is largely restricted to the injection area, these redox reactions are also largely restricted to the same area. Thermodynamic calculations indicate that reduction reactions should proceed in the order of O2, NO3-, Mn4+, Fe3+, SO42-, and CO2. However, these processes often overlap (e.g., methane production occurring before complete sulfate reduction) due to spatial variability, energy limitations from low reactant concentrations, slow reaction kinetics, and addition of excess electron donor. In the injection area, O2 and NO3- decline rapidly following substrate addition and often remain low for years after TOC declines due to reduction of O2 and NO3- by sediment organic carbon and/or reduced minerals. Concentrations of O2 and NO3- in downgradient wells decline with the arrival of anaerobic, oxygen- and nitrate-depleted water. In most cases, there is little or no increase in O2 or NO3- with distance downgradient due to the limited mixing between the anaerobic plume and background aerobic groundwater. SO42- concentrations follow the same general pattern as O2 and NO3-, with an initial decline in the injection area following substrate addition. However, biodegradation coupled to sulfate reduction is less energetically favorable than biodegradation coupled to O2, NO3-, Mn4+, and Fe3+ reduction. As a result, SO42- is depleted more slowly than these other terminal electron acceptors (TEAs) and substantial amounts of SO42- may persist in the injection area if background SO42- levels are high. In downgradient wells, SO42- concentrations decline with the arrival of anaerobic, low SO42- groundwater. In most cases, there is little increase in SO42- with distance downgradient due to the very limited mixing between the anaerobic low SO42- plume and background higher SO42- groundwater. The amount of dissolved S2- produced from SO42- reduction depends on the SO42- concentration, extent of SO42- reduction, and the amount of Fe2+ and Mn2+ in groundwater. If S2- is in excess (Saturation Index of FeS>1), then S2- will persist and limit the extent of Fe2+ released to solution. In practice, at most sites sufficient sediment-bound Mn and Fe are present to react with S2- and precipitate as low solubility sulfide minerals. As a result, aqueous sulfide concentrations are low in the injection area and downgradient aquifer. In uncommon cases where SO42- concentrations are high and solid phase Fe is low, some dissolved sulfide may migrate a short distance downgradient before reacting or precipitating. Once injection area TOC declines, SO42- is expected to recover somewhat more rapidly than O2 or NO3-. Excess TOC in the injection area will stimulate reduction of solid phase Mn4+ and Fe3+, causing a gradual increase in Mn2+ and Fe2+. Much of the reduced Mn2+ and Fe2+ produced in these reactions will be retained on the aquifer material within the injection area through a variety of processes including ion exchange and surface complexation reactions. However, a portion of the reduced Mn2+ and Fe2+ will be in the aqueous phase and migrate downgradient with natural groundwater flow. Sorption reactions will diminish the rate of transport of Fe and Mn compared to the groundwater flow rate as well as the maximum concentrations observed in downgradient wells. However, significant increases in Mn2+ and Fe2+ have been observed in monitoring wells at significant distances downgradient. In some aquifers, Mn2+ and Fe2+ concentrations have been observed to decline before TOC is depleted, presumably due to depletion of bioavailable Mn4+ and Fe3+ in the injection-area aquifer materials. 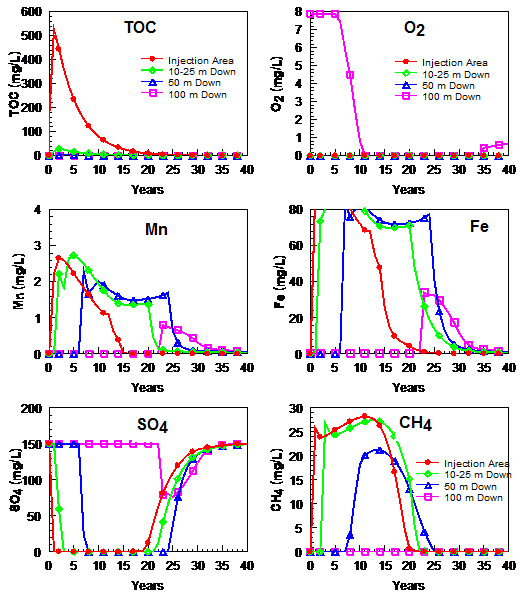 Once TOC levels decline in the injection area, production of additional Mn2+ and Fe2+ will slow and dissolved Mn and Fe concentrations in monitoring wells should start to decline. In some aquifers, arsenic (As) is naturally present as As4+ sorbed or coprecipitated with Fe3+ or other minerals. The general term sorption is used to encompass all binding mechanisms of As to Fe3+ phases. If arsenic is present in these forms, the TOC addition to remediate contaminants could release dissolved arsenic to groundwater by both reduction of Fe3+ to Fe2+ and As5+ to As3+. As Fe-rich groundwater migrates downgradient, Fe2+ sorbs to the sediment or precipitates as Fe-bearing minerals (FeS, carbonates, magnetite) and aqueous Fe concentrations decline. Available monitoring data suggest that arsenic follows a similar pattern and aqueous arsenic concentrations decline as the anaerobic plume migrates downgradient and encounters Fe3+-rich sediments. Once TOC concentrations in the injection area decline, Fe3+ and As5+ reduction is expected to decline with a concurrent decline in arsenic release. At sites where concentrations of sediment-bound As5+ are low, minimal arsenic will be released. TOC fermentation products (H2 and acetate) in the injection area that are not consumed in microbially-mediated reactions with contaminants or background electron acceptors will be fermented to CH4. This can result in high CH4 concentrations in the injection area and downgradient aquifer. If the sum of gas partial pressures (mainly N2 + CO2 + CH4) exceeds the hydrostatic pressure, these gases will come out of solution and form bubbles. This occurs primarily near the water table due to the lower hydrostatic pressure there compared to deeper levels. At greater depths, groundwater can appear to be supersaturated with CH4 due to the higher pressure. In relatively homogeneous, coarse grained sediments, gas bubbles can migrate upward into the vadose zone, removing CH4 from the aquifer. However, in finer grained sediments, upward migration of gas bubbles will be more limited. If the gas bubbles are not released to the vadose zone, they may eventually dissolve, releasing CH4 back into groundwater. Dissolved CH4 produced in the injection area will migrate downgradient with groundwater flow. Since mixing between the anaerobic plume and aerobic background groundwater is low, aerobic methane oxidation will be limited. Recent research suggests that CH4 plume migration may be limited by anaerobic oxidation of methane (AOM) using NO32-, Mn3/4+ and Fe3+ or SO42- as terminal electron acceptors. However, this reaction may be slow or may not occur at some sites. As a result, dissolved CH4 can migrate long distances in some aquifers. Once TOC in the injection area declines, CH4 production will stop and dissolved CH4 should be transported downgradient by groundwater flow. When implementing enhanced anaerobic bioremediation systems, designers should be aware that some level of SWQIs occur at every site. However, concentrations of all parameters decline with distance downgradient following reasonably well understood and predictable processes. Importantly, elevated levels of SWQI parameters are usually confined within the original contaminant plume and are unlikely to adversely impact potable water supplies. ^ Jacob, C., E.F. Weber, J.N. Bet, and A.K. Macnair, 2005. Full-scale enhanced reductive dechlorination using sodium lactate and vegetable oil. In: Proceedings of the Eighth International In Situ and On-Site Bioremediation Symposium (Baltimore, MD; June 2005), Battelle Press, Columbus, OH.